What Did You Do When the Market Was Down? Do you remember those days last summer when the Dow went down 400 points one day, then it went up 400 points the next day, before it went down another 400 points the following day? That time has come. It is now. It took about six months to recover from the turbulence. It’s time to reflect on what you felt, and more importantly, what you did during that time. Did you sell stocks to avoid further losses? I doubt it. The behavior trait loss aversion makes it very hard for people to sell after the prices have already gone down. I would say “individual investors sell at the bottom” is a myth, not supported by facts. Although there were net outflows from equity mutual funds during that time, the outflows were very small relative to the total amount invested in the funds. According to data from ICI — the mutual funds trade group — total outflows from equity funds between August and November 2011 were $80 billion. Total amount invested in equity funds? Over $5 trillion. That’s $5,000 billion. In other words, investors pulled out less than 2% of their investment in equity funds when the market was down. 98% of the money stayed the course. So if you simply hung tight and didn’t sell, don’t pat yourself on the back just yet. Most others didn’t sell either. Although the vast majority didn’t sell, some of them may have suspended buying. Between early July and early October 2011, stocks dropped sharply in three months of time. When the market was dropping that fast, it was easy for some people to freeze up and wait for better days. If you were buying before the drop, did you stop buying after the drop? Nobody likes losses. However, if you were troubled enough by them that you stopped buying, it’s a sign you have too much risk in your portfolio for your risk tolerance. As nisiprius wrote, now it’s time to think about whether you need to do something about the mismatch. Either harden yourself and get used to it — another drop like that can happen any day now — or take a step away from the heat. You want to have a portfolio mellow enough that you are comfortable with continuing buying into it even when the market is dropping. Still, because the drop didn’t last long, I doubt many messed with their dollar cost averaging in their 401k plan accounts. Again, continued buying due to inertia is just average. If you have stock funds or ETFs in a taxable account, did you harvest losses? It was a good time for tax loss harvesting. If you did, you would have created or added to your capital loss, to be used to offset your income for years to come, $3,000 at a time. The harvested loss will also cushion any capital gains you may have to realize in the future. Tax loss harvesting takes a deliberate action. If you did that, you did something most others didn’t. Continuing buying at lower prices with new money is great. Buying more with existing money is even better. That’s rebalancing. Did you chicken out and not carry out rebalancing as you originally planned? Here we are seeing a 5% band-triggered rebalancing worked better than a calendar-based rebalancing method. 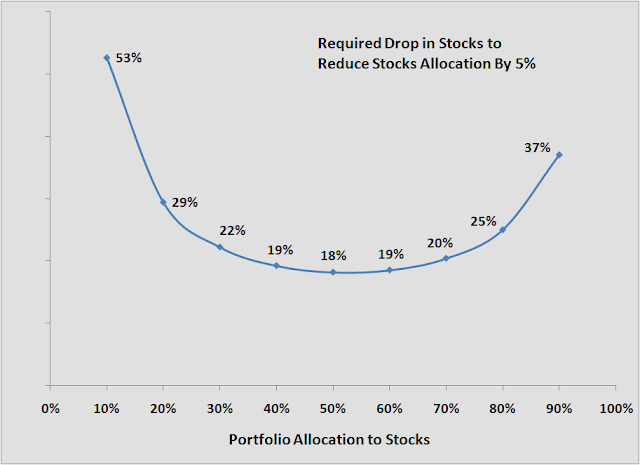 A 20-30% drop in stock prices should’ve lowered the weight in stocks by 5% or more in most portfolios. If you used a 5% rebalancing threshold, you would’ve sold a chunk of bonds to buy stocks, near the low in early October. If you waited until December or January for your calendar-based rebalancing, the low prices were gone by that time. If you did rebalance last summer, with the recent surge in the stock market, are you close to another rebalance in the other direction? Now it’s reflection time. Action speaks louder than words. There is a big difference in knowing what you are supposed to do and actually doing it. What did you do when the market was down? What does that tell you about the risk-appropriateness of your portfolio? I harvested losses in first week of August and at the end of Nov. I did buy at falling prices. I did not rebalance though as the buying at falling prices took care of bringing asset allocation in line. This tells me my portfolio size is still somewhat small compared to the new money I put in each year. I guess for a portfolio whose size is large compared to the new money you will add to it each year will need rebalancing depending on the swing of the markets. I did not do anything to my portfolio during late summer last year. I don’t remember if I noticed the market swings or not. This posting is a great framework for reflection. I did OK on buying, but bought too few extra stocks during the dips and did not realize one fund was not automatically investing monthly contributions. I forgot what I did but a quick look at my transaction history showed that I rebalanced. Woot. I am confused as to the mechanics of bands used to re-balance an allocation. It seems to me that a 5% band could be +/- 5% of the total portfolio or +/- 5% of the absolute percent. In the latter case the width of the band at 30% allocated would be +/- 1.5% of the total portfolio. It would be +/ – 2% at 40% allocated. You appear to use the former definition of band, is that right? Do you see any rationale for the latter? Response to change is faster at lower allocated assets. @chuck – Yes, I use the former, i.e. percentage point change of the total portfolio. A 5% relative change within the stock component would be too small. Rebalancing too frequently creates a lot of churn. I harvested a ton of losses, and also bought more (being careful to avoid a wash sale). I didn’t do anything when the market was going down. I did sell some stocks to raise more money for my down payment in November. I’m quite surprised that I didn’t do anything, but I didn’t do any rebalancing either – I just kept on contributing. Really encouraged by this. My triggers told me to rebalance in April, early August, and late January (just a couple weeks ago) . My portfolio follows the S&P, rather than the Dow, but the same idea still holds. I successfully did all of these. This type of reflection is crucially important, especially at times of relative prosperity because it can help prevent large amounts of pain going forward. TFB, the 5% trigger curve posted above is incredibly valuable, I have that and the corresponding formula in my analysis, and it has already helped me benefit more from understanding the value of rebalancing better. I kept buying, and eventually switched out of some of my defensives (consumer staples) into riskier stuff. Mostly it worked okay, but one long-dated option-like investment (it’s called a subscription share, I don’t think you have them in the US) has kept declining, seemingly on sheer inertia. So I’ve kept buying. @Monevator – The subscription share is probably similar to convertible preferred shares in the US. When you hold convertible preferred, you get a dividend and you have the option to convert them to common shares at a predetermined ratio after a certain date, giving you that long-dated option-like characteristics. The only change I made was to make an extra whopping $60 contribution to my Roth IRA in early September ;-). Good post. Due to my chosen strategy I did not buy more during that plunge. I do not rebalance in traditional sense, but instead allow my stocks to “ride” while using dividends and new contributions to slowly build the fixed income allocation till I get to 50/50. Just my personal preference; I would not recommend it to other investors. Also, now would be a good time to remind readers that just as it was time to rebalance into stocks during the plunge so are today’s multi-year highs a good time to rebalance out of stocks into fixed income. This is where I made my money…bought more of what I had and sold the additional when I got back up 8-15%… Trading the range helps boost your returns. I ended 2011 up 17% and 10% on personal account/401k respectively. I also do worse in a continuing up trend, like now. I’m only up 4.5% when the market is up 8%. Buying some protection right now with a pullback anticipated. Bought some TVIX for a little insurance.